In the event of an emergency, the FAA requires that all passengers and crew onboard an aircraft be unloaded in under 90 seconds. Manufacturers have to demonstrate that everyone is able to escape to safety before an aircraft can be certified for commercial use. This requirement was a major concern with a futuristic flying boat concept that emerged earlier this year, and there’s good reason to be concerned about evacuation times with this new Airbus patent. With the extra steps needed to access the mezzanine (middle/intermediate) level, it seems highly unlikely that everyone could safely bail out in 90 seconds. If even one person tripped or fell down while trying to evacuate, it could cost hundreds of people their lives. It wouldn’t even take a serious emergency for this new patent idea to cause harm. Can you imagine what could happen if the aircraft hit turbulence? What if someone on the mezzanine level spilled their hot coffee on a person below? There are way too many unknown variables that could lead to potential injury and conflict in the cabin. Another reason why the these new patent images from Airbus probably won’t become real is because companies patent crazy ideas like this all the time. This is done to protect their intellectual property, and also to save potential ideas for the future without risk of a competitor bringing them to market first. Last week I attended the APEX (Airline Passenger Experience Association) EXPO in Portland, Oregon and had the chance to explore several new Airbus interiors using a very cool virtual reality demo. After “touring” the new A350 XWB, A330-300ceo and A380 cabins, I saw absolutely nothing that would suggest that Airbus is planning on cramming people into their airliners such as in these patent images. Even though you can’t see what I was seeing in the Airbus VR demo, you can tell it is very exciting judging by how much my hair is sticking up. 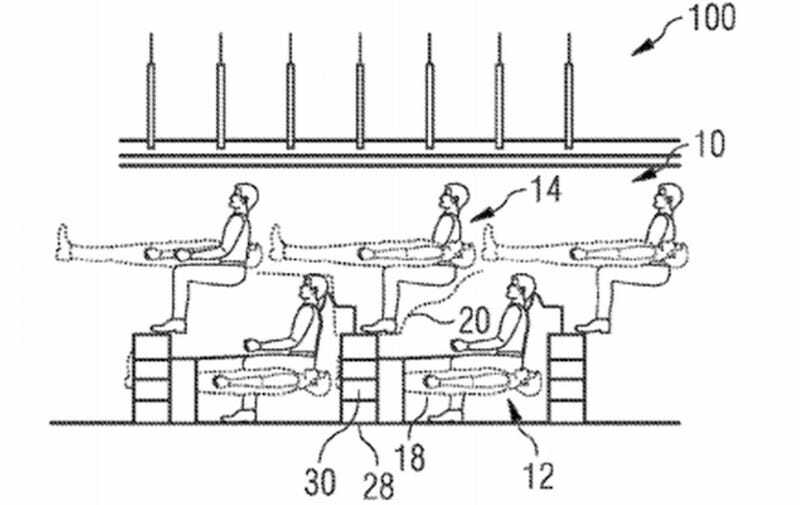 The new Airbus cabins I was shown were actually quite the opposite of the people-sitting-on-top-of-people patent idea. Everything I saw was aimed to increase comfort, rather than increasing awkwardness. By all accounts, the cabins that Airbus is actually bringing to market appeared to be comfortable, spacious and futuristic, with everything from lie-flat bed surfaces, to LED mood lighting with millions of color combinations, to new swiveling overhead compartments that can accommodate significantly more luggage. I was left with the impression that Airbus is much more focused on making commercial flying as comfortable as possible than looking for probably-unsafe ways to maximize the potential passenger count on each of its airliners. And while it would be nice for airlines to be able to sell more seats on the same flights, this layered seating configuration patent raises far too many practical questions to be considered anything other than just a crazy idea.